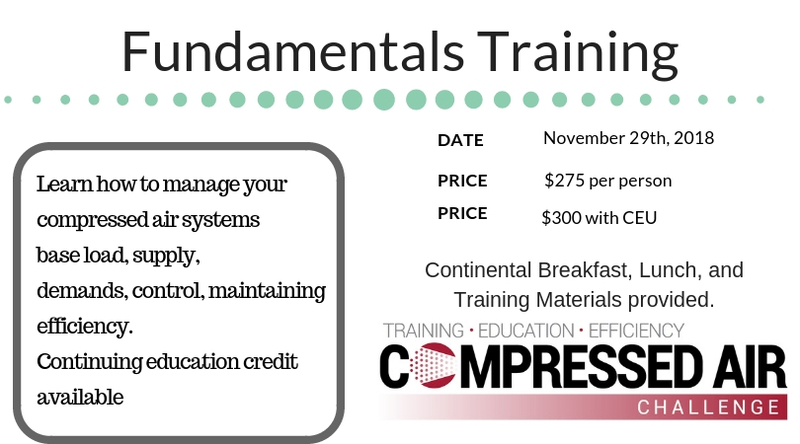 Compressed Air Challenge© has announced they will be offering their Compressed Air Fundamentals Training in Grand Rapids, Michigan November 29, 2018. The Compressed Air Challenge© is a voluntary collaboration of industrial users; manufacturers, distributors and their associations; facility operating personnel and their associations; consultants; state research and development agencies; energy efficiency organizations; and utilities, that are determined to help you realize the benefits of smart compressed air management. As a result, they have developed the Fundamentals of Compressed Air Systems one-day training.Two instructors who have been screened and qualified by the CAC will teach the training session. Materials, continental breakfast and lunch are included in the registration fee for this one day event.